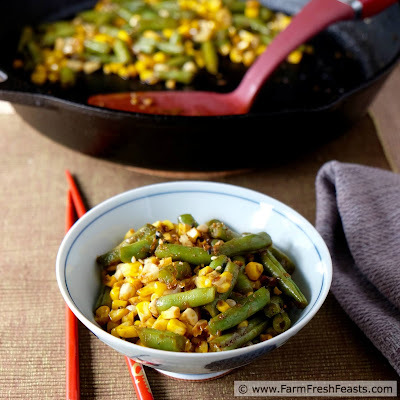 Nearly a Korean Succotash, this skillet side dish of fresh corn and green beans is spiced up with a teriyaki and gochujang sauce. Moving to Ohio I understood that I'd be living in a more rural area. Shoot, I drive past 3 farms just taking my daughter to sewing school [she made a medieval dress last week at camp--how cool is that?]. This fact reminds me of when I joined the Air Force to see the world. This suburbanite drove past 13 barns (!) en route to work each day. Quite a shift from the beltway and subway commutes I'd been used to, so I'd say I did see more of the world even before moving overseas and deploying. 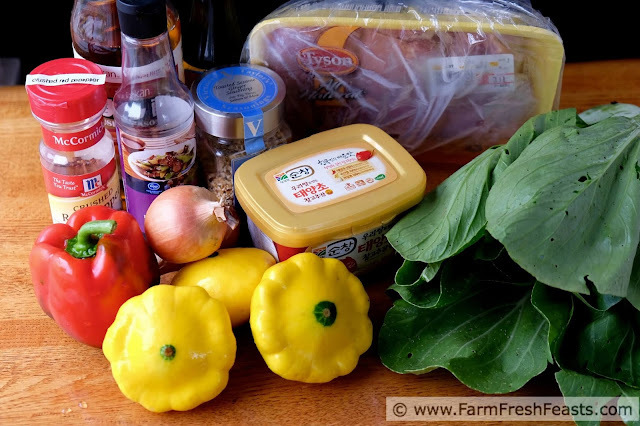 What I hadn't expected in Ohio, and what was a happy surprise, was all the farm produce that appears every summer in addition to our Community Supported Agriculture (CSA) farm share. There's a wagon with a red striped awning that parks next to a Tim Horton's with produce each week. A flat trailer that appears with corn in a shady area of a strip mall lot. A 'peach truck' I just heard about from a fellow band parent (but haven't seen yet--saving that for next year). And of course our local farmer's market, a few blocks down the street on Saturday mornings. Thanks to these folks I am able to squirrel away plenty of corn for winter while still enjoying some ears fresh. For more recipes using corn, please see my Recipes Using Corn Collection. 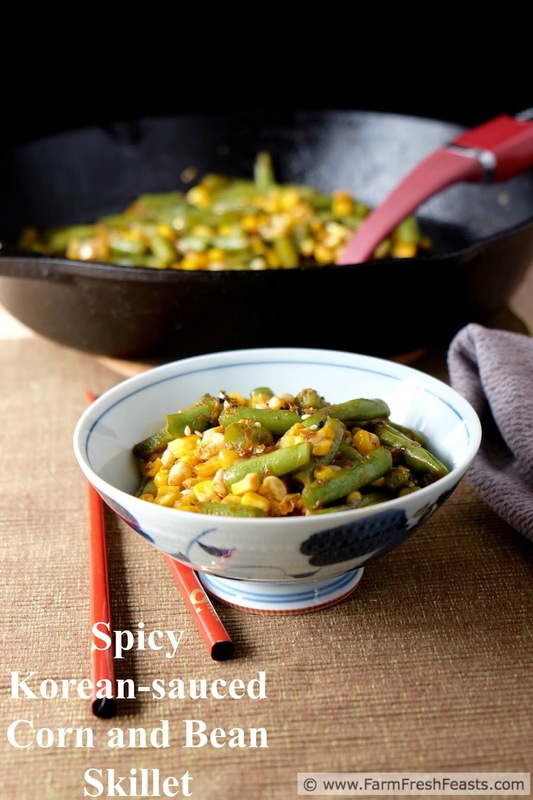 For more using green beans, please see my Green Bean Recipes Collection. These are part of the Visual Recipe Index by Ingredient, a resource for folks like me eating from the farm share, the abundance of fresh produce in my community, and from generous neighbors. I'm on a Corn Sweet Corn Pinterest board with loads of ideas from around the web, follow that for more ideas or follow me in general for all of my pins. Want to know how to use this blog? Click here. This year I keep making mixtures of corn and green beans since our farmers are doing such a terrific job of growing beans (and staying out past dark picking 200 ears of corn from their friends to include in our boxes). 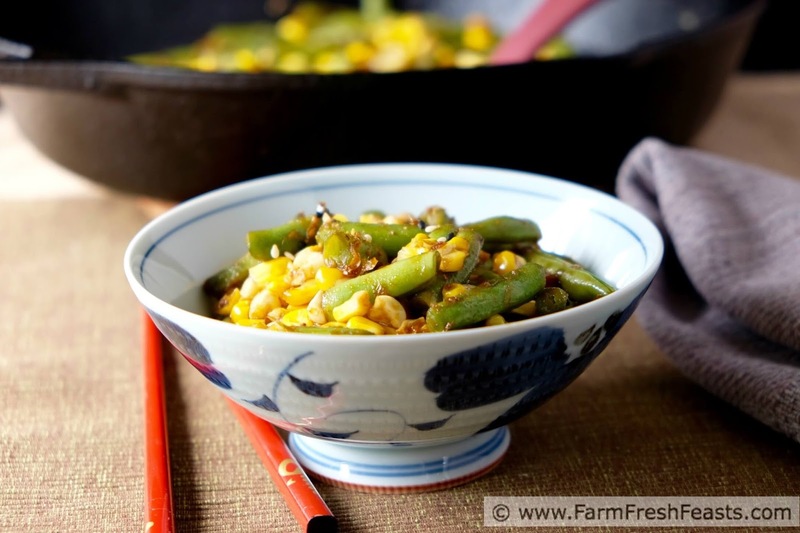 I figured I'd get another side dish from last year up on the blog, before the newer dishes trip over it in their haste to be published. Yeah, my recipes are as unruly as Simon, Vincent and Robert Barker anticipating mealtime. After I made Grilled Korean-seasoned Chicken Thighs and Bok Choy I had some leftover sauce. I used this over a skillet-cooked corn and green bean blend from the farm share. It was lovely on its own, with rice an eggs for a meatless meal, as well as with leftover grilled chicken (all the ways my family ate it). Note: You don't need to make all that other recipe first, though. I've cut down the proportions of sauce ingredients below if you want to make just enough for one side dish. The trickiest-to-find ingredient, gochujang, comes in a tub in my commissary and large Kroger, as well as in bottles in the grocery store down the street. I've got a picture of the tub below, and the jars in my original post using gochujang, and here's an Amazon affiliate link so you know what you're looking for. Whisk together sauce ingredients in a bowl. Pour into a saucepan and bring to a boil for 5 minutes, then remove from heat. Preheat a large skillet over medium heat and add the butter. When it has melted, add the beans and stir to coat with fat. After 3 minutes (the amount of time it took me to prep the corn) add the corn and stir again. Cover at cook for 5 minutes until the vegetables are slightly tender. Pour the sauce over top, stir to coat, and simmer another 3 to 5 minutes until the sauce is clinging to the vegetables and the vegetables are tender. 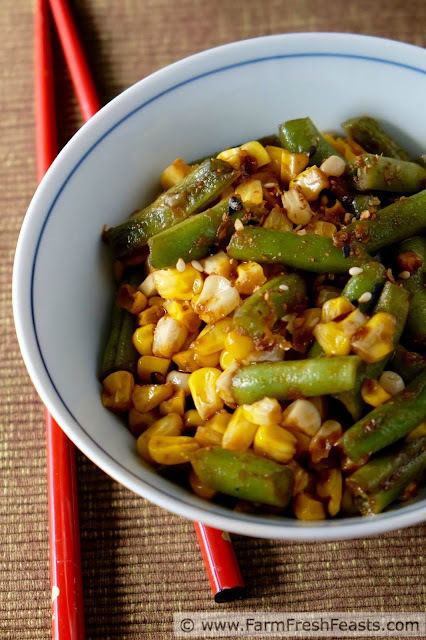 To serve, add a pinch of toasted sesame seeds on top. Serve warm. Popping in to say I loved everything about this post. The barns (although hey you can move to Ohio and not end up anywhere that rural lol ;) ), the unruly dogs comment, the pedicure comment and the especially the dish. Great job! 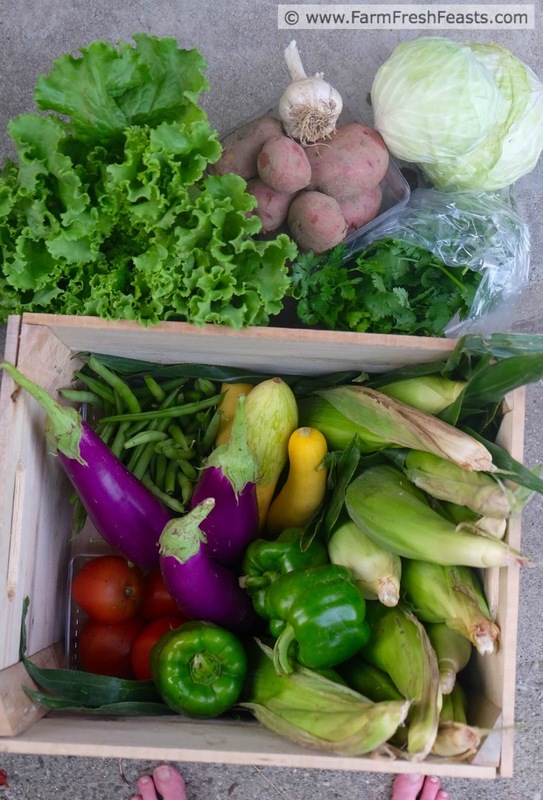 You can move to lots of places and not end up anywhere rural, but Dayton seems to have a surprising amount of homegrown produce sold outside of official farmer's markets for a city. Kirsten, I am happy you are pleased with Ohio produce. I was just visiting my friend yesterday in Medina and was blown away by the amazing Farmer's Markets finds she had there! I had to look up where Medina is (because I can't even keep I-70 and I-75 straight even though I drive on one or the other of them weekly and am fully aware of the North-South-Odd and East-West-Even interstate rule, but the numbers are too close together and when I learned of them both at the same time they got jumbled in the brain). I've never been near there, but no matter--I think Ohio has amazing produce all over the state! Looks super delicious Kirsten. I'd not heard of gochujang and so I always learn something new here! And kudos to your daughter on the medieval dress! I sew and it's becoming a lost art. Love to hear of kids who are learning to sew! I keep hearing that schools do not offer sewing and that sentiment just does not jive with my practical experience. I can only speak of a school system in Virginia and a school system in Ohio, but my kids have had the opportunity to take shop, to make food, and to make clothing and other homemade items (the basic class includes a gym bag--how clever is that?). I think all of the testing gets all the press, but regardless of what the name it goes by now--Family and Consumer Science I think--I've found these classes alive and well-attended. I think the idea that sewing your own clothes is cheaper than buying them is all wrong, though. Good hell fabric costs money, notions cost money, plus the time! Still, life skills and all, plus it's awesome to see girls in my daughter's sewing school sewing their own prom dresses. I cannot get enough corn this time of year. Our once a week CSA corn lasts one night and the farmer's market is the same day as we usually pick up our CSA...we should probably go during the week instead but it is so hard to find the time! Your recipes always look wonderful to me! I'd never heard of gochujang,before...I'm going to have to check that out. It's funny how many items my local Kroger carries that I wouldn't know about unless I knew what to look for. Like gochujang.